Schematic and PCB layout finished, boards ordered | What's All This Brouhaha? Late last night I finished the schematic and PCB layout, and ordered boards. As soon as I woke up this morning I realized that I forgot to deal with the 5V CMOS output of the TIA-232-F receiver feeding the non-5V-tolerant FPGA input. There needs to be either a series resistor or a pair of resistors as a voltage divider. I’ll have to cut that trace and bodge one or two resistors. I ordered parts from Digi-Key to build two units. Of course, shortly after placing the order I realized that I’d forgotten to order power supplies. It doesn’t require anything too special, just regulated 5V 2A with a 2.1/5.5mm coax plug. I expect most of the Digi-Key order to arrive on Friday, and the PCBs will likely be here on Monday. 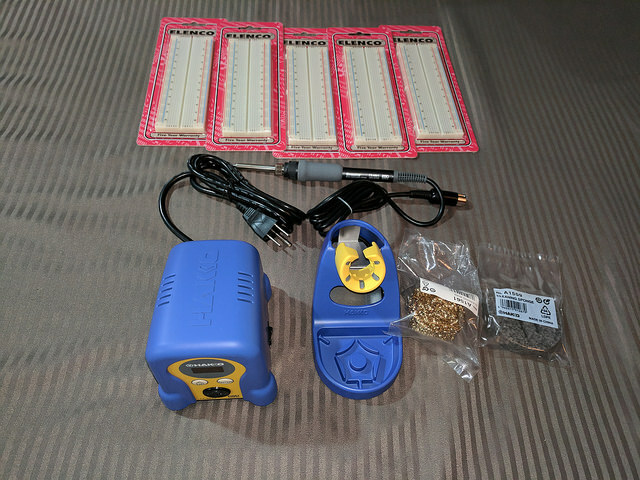 I have two soldering stations at home, but I’m not there so I had to order a Hakko FX-888D to use here. I also expect to breadboard a few more things, so I ordered five more solderless breadboards, and (not shown) more precut breadboard wires.